ROCK HILL, S.C., Oct. 11, 2017 /PRNewswire-USNewswire/ -- Wounded Warrior Project® (WWP) Soldier Ride®, presented by USAA®, continued its roll across America to serve another community of wounded warriors. In South Carolina, over 40 warriors hit the road and began building a local network of veterans that can provide critical support on the path to recovery. Army veteran Triron James showed up for the ride to get more than just a workout on the bicycle underneath him. "I wanted to link up with other veterans and get that sense of unity back," Triron said. "I came out here hoping to challenge myself physically, but also to learn more life skills and build a network with other veterans in my community. We all have that service history in common, but it's surprising how quickly everyone has come together. Everything comes back together to give us that sense of unity. We're all motivating each other, supporting each other. I needed that, and I need it in my day-to-day life." "In the civilian sector, people have a hard time understanding what it's like to live with the invisible wounds of war," said Army veteran Rose Jones. "When I get around my fellow veterans we pretty much all go through the same things, and we get what it's like to live with invisible wounds. That's why I love being part of this community. Ever since I joined Wounded Warrior Project, my life has changed for the better. It's one of the best decisions I've ever made." To learn more about how WWP's programs and services connect, serve, and empower wounded warriors, visit http://newsroom.woundedwarriorproject.org. 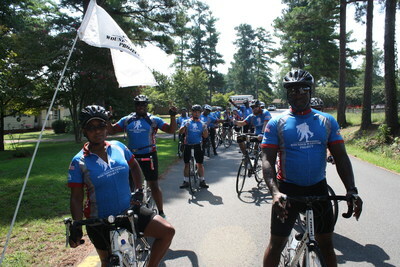 To find photos from this Soldier Ride, click on multimedia, then images.